Falcon has experienced explosive growth in the last twenty years and has become a very attractive place to find a foreclosure deal. The location is very convenient for military families and those that are just trying to escape the hustle and bustle of the city but still have the amenities. There are great foreclosure deals to be found here, with some single family homes listing under 100K and ranging up to over 200K. The centerpiece of Falcon is the amazing amazing Antler Creek Golf Course. This is a public, Rick Phelps designed golf course that features a player-friendly design that artistically winds through the Meridian Ranch and Woodmen Hills communities. At over 8,000 from the tips, it is also Colorado's longest golf course, featuring three lakes and 73 bunkers. The clubhouse also offers a pro-shop and the Creekview Grill. Great foreclosure deals can also be found in the Falcon Hills and Falcon Heights neighborhoods. Falcon offers a Safeway grocery store, Walgreens and a Walmart Super-Center as well as a number of restaurants, coffee shops and other urban amenities. 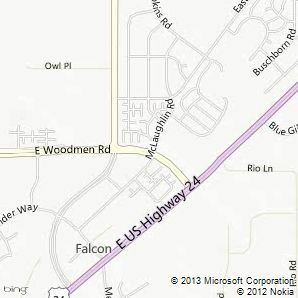 Falcon is also one of the closest communities to Schriever AFB, just a few minutes’ drive down the Falcon Highway. Hwy 24 is the main thoroughfare west and provides access to Peterson AFB, Powers area theaters, restaurants and shopping as well as Downtown Colorado Springs. Woodmen Rd to the south provides easy access to North Colorado Springs and I-25. One of the great assets to Falcon is the Meridian Ranch YMCA. This is a residents-only multi-purpose recreational center that is supportive of children and families as they strive to improve their health in spirit, mind and body. Some of the amenities include a fitness Area with cardiovascular and weight training Equipment; innovative programs, aerobics studio, outdoor pool group exercise classes from traditional aerobics and kickboxing to yoga and pilates; gymnasium and sauna as well as staffed child watch for kids while their parents workout. Falcon is is served by District 49, whose mission is to prepare students, in a safe and caring environment, to be successful, competent and productive citizens in a global society. Most of the students here attend Falcon HS. Falcon Colorado is one of the most innovative and growing communities in the Pikes Peak Region. With its proximity to Air Force bases, affordable homes, golf course, community center and great schools, a foreclosure deal here is a great find. Click here to search all Falcon homes for sale.